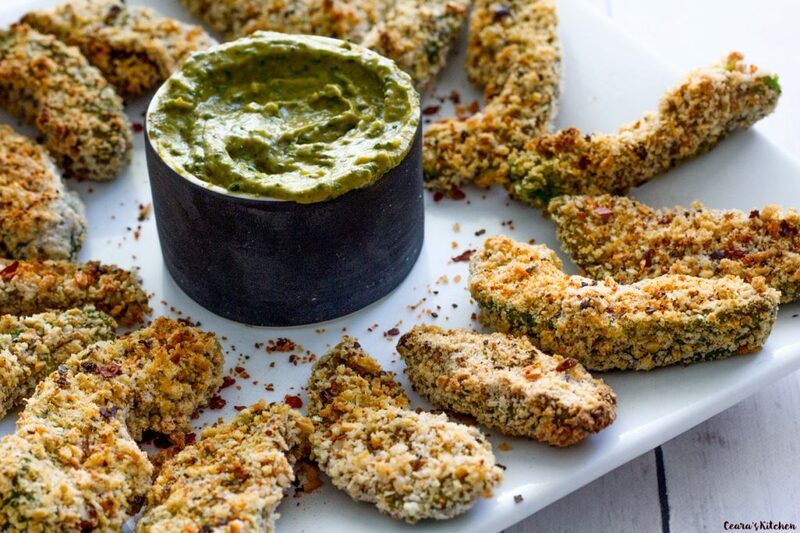 Baked Vegan Avocado Fries. Ripe, sliced avocado is tossed in a flavorful bread crumb mixture and baked until golden brown and crispy. These healthy fries make the perfect appetizer dipped in my Smokey Tangy Avocado Dip. Hey guys! How are you doing?! I have a few behind-the-scenes projects in the works and I cannot wait to share them with you. I am so excited to start reaching out to more of you in person at a few events I am planning as well as through other mediums (to reach those not living close-by to Toronto) where we can share ideas, talk about cooking and food (obv) and build community. 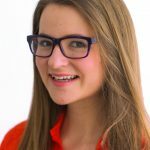 I can’t wait to share my upcoming projects with you and hear your feedback. Stay tuned for more to come! Who loves when their avocados are the perfect amount of ripe?! You know the time leading up to when you are waiting for your avocados to ripen and then all of the sudden they are PERFECT and you want need to put avocados in everything (or just eat them straight-up with a spoon). And what do you do when your fruit bowl full of avocados all ripen at the same time?! Make Crispy and Golden Brown Vegan Avocado Fries, of course. 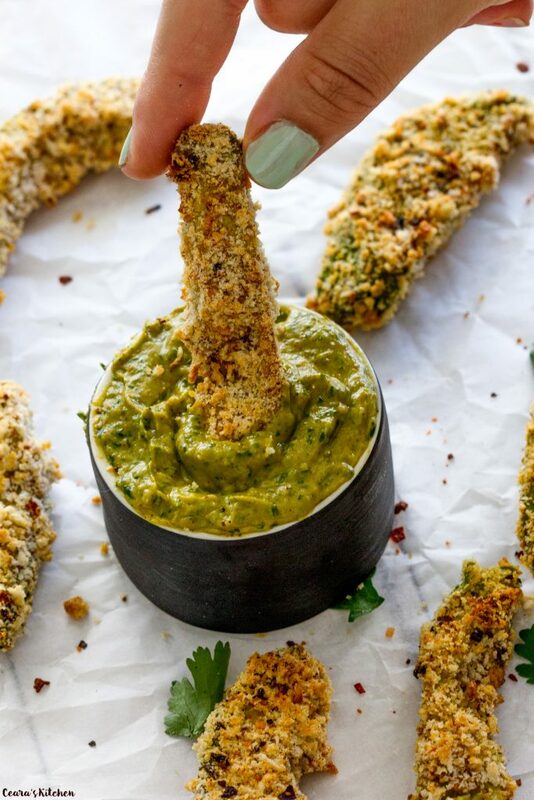 I think I almost cried of joy when I dipped these Baked Avocado Fries in my Smokey Avocado Dip. 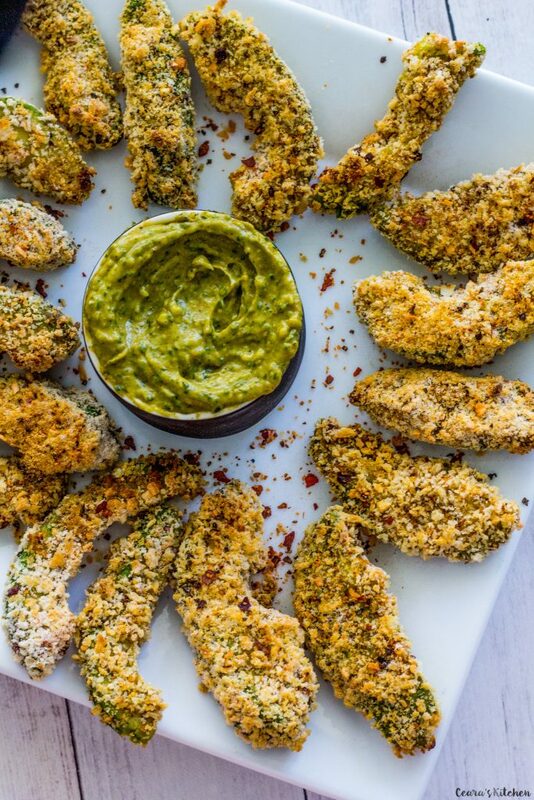 Crispy Avocado Fries + Smokey Creamy Avocado Dip = a little piece of heaven. Seriously. I have a hunch that these fries would be perfect in tacos, burritos and in a taco salad bowl. 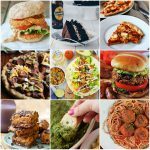 If you make these Vegan Avocado Fries at home, snap a photo and tag me #CearasKitchen on Instagram or leave a comment below – it makes my day hearing from all of you! 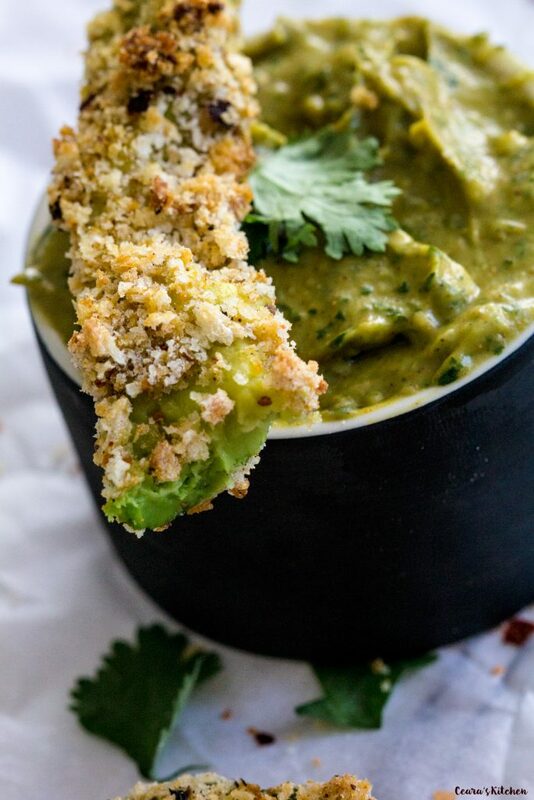 Baked Avocado Fries – Ripe avocado slices are tossed in a flavorful bread crumb mixture and baked until golden brown and crispy. These healthy fries make the perfect appetizer dipped in Smokey Tangy Avocado Dip. Mix together ground chia seeds, lime juice, water and hot sauce in a small bowl. Leave to sit while preparing the rest of the ingredients. Mix together panko, flour, smoked paprika, garlic and onion powder, <g class=”gr_ gr_107 gr-alert gr_spell gr_run_anim ContextualSpelling multiReplace” id=”107″ data-gr-id=”107″>chilli</g> powder (optional), sea salt and pepper in a medium size bowl. Slice avocado in half. Make 4-5 slices lengthwise on each side of the avocado. Carefully scoop out the avocado with a spoon. Give the <g class=”gr_ gr_123 gr-alert gr_spell gr_run_anim ContextualSpelling” id=”123″ data-gr-id=”123″>eggy</g> mixture a stir. Dip each slice of avocado <g class=”gr_ gr_103 gr-alert gr_gramm gr_run_anim Grammar multiReplace” id=”103″ data-gr-id=”103″>in</g> the <g class=”gr_ gr_124 gr-alert gr_spell gr_run_anim ContextualSpelling” id=”124″ data-gr-id=”124″>eggy</g> mixture and then in the breadcrumbs, making sure to coat each avocado slice fully with the breadcrumb mixture. Add water, by the teaspoon, to the <g class=”gr_ gr_125 gr-alert gr_spell gr_run_anim ContextualSpelling” id=”125″ data-gr-id=”125″>eggy</g> mixture if it gets too thick. Lay each breaded avocado slice on the baking sheet until all your avocado is used up. Leave about 1/4 inch between each avocado slice (if they are too close together, the avocado fries will not be as crispy). Spray avocado fries with cooking spray and sprinkle with hot pepper flakes. 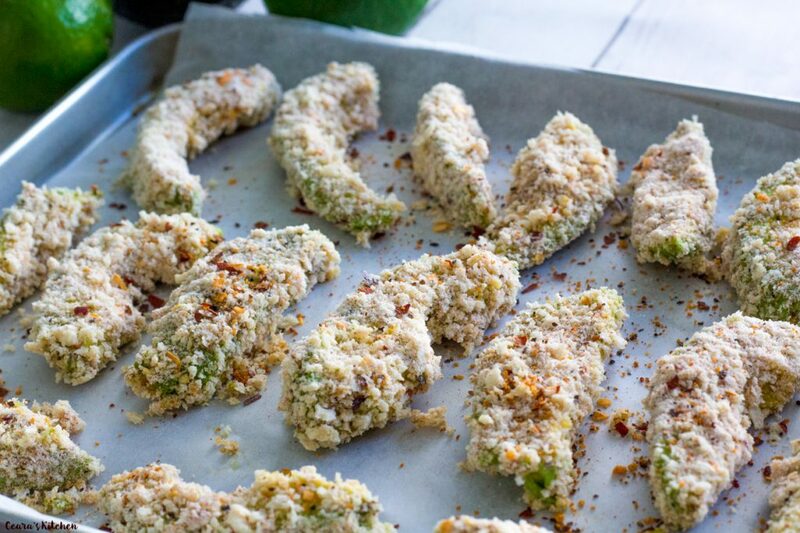 Bake for 12-16 minutes until the avocado fries are golden brown and crispy. Place all the avocado dip ingredients (avocado through to onion powder) in a blender. Blend until creamy smooth. Taste test and add sea salt, pepper and hot sauce to taste. 1) Use gluten free flour and gluten free panko breadcrumbs for this recipe to be gluten free. [br]2) Do not use cooking spray if you want this recipe to be oil-free. I eat avocado every single day! Love the richness and creaminess of this wonder fruit 🙂 Had only savoury version before, but it was long time ago. We ended needing twice of the egg mixture so plan accordingly! Otherwise, totally delicious. I tried them tonight with dinner. FABULOUS. I can’t wait to have them again. Thank you for sharing. Haven’t tried yet, but this sounds fabulously delicious. What a good idea to use those avocados, when you have a bunch ripening at the same time. Thank you so much, Veronika!! 🙂 Enjoy!! 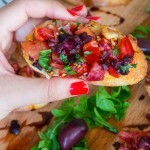 Would the coating work if i used ground/chopped seeds and nuts instead of breadcrumbs?